The Count Junior HC20MS Mobile Plain Top Hot Cupboard comes with a digital temperature display as standard and top level recessed, adjustable thermostat controls. This product also comes with 100mm swivel type castors, two braked. All of the units in this range come under 3Kw with a 13 amp plug which is on a curly cable with plug park. The Bain Marie can accept Gastranorm 1/1 containers up to 150mm deep. All units are of double skin construction providing coolwall exterior for safe and effective operation and come with a robust push/pull bar. The sliding doors are top hung meaning zero dirt traps to front edge. 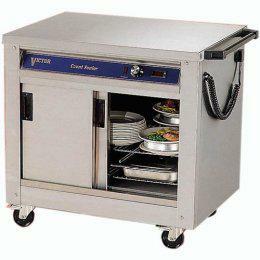 This hotcupboard is constructed to make servicing quick and easy, saving money in operating costs. All serviceable parts can be easily accessed with plug in heating elements replaceable within minutes. More products in Hot Cupboards.